Answer: Both Nike® and Levi’s® understand that consumer experience and personalization are key to the future of retail and brand dominance. While Nike and Levi’s opted for a different approach to engaging the consumer once the consumer walks through the doors of their new “brand temple,” both approaches work and are apropos in support of each of the company’s unique brand promise. Nike opted to leverage digital enablement to drive connection, experience, and personalization in their newest retail store. The NikePlus™ App is the connective tissue that drives the consumer experience and makes it easy to explore, shop, request sales assistance, and physically unlock access to reserved product. Even if the consumer opts to leave the store without making a purchase, the consumer is the proud owner of the NikePlus App that gives the consumer perks such as special pricing, personalized recommendations and exclusive product offers. Best of all, Nike has the opportunity to develop a solid relationship a new consumer. Meanwhile, Levi’s approach to integrating consumer experience in their Times Square store is to showcase its roots of authenticity through products and services. The 16,800 square foot store celebrates all of Levi’s converted products under one roof (including Levi’s®, Levi’s® Premium, Levi’s® Made & Crafted, Levi’s® Vintage Clothing, Levi’s® Authorized Vintage, Levi’s Collaborations, Accessories, Footwear, and Kids as well as hyper-local Levi’s product only offered at the Times Square location). Levi’s also offers consumers the ability to customize jeans and T-shirts in the Levi’s Tailor Shop®. The Times Square Tailor Shop offers comprehensive customization options with four on-site tailors and direct-to-garment (DTG) printing capabilities—the largest Tailor Shop the company has opened to date. Don’t get me wrong: Levi’s newest store incorporates and leverages digital technology and omni-channel capabilities as a means of providing ease and convenience. But, unlike Nike, the Times Square Levi’s Store doesn’t require the consumer to use their digital device to experience and connect. Instead, Levi’s opts to bring their retail brand story to life via a theater-like expression of product and service, which makes perfect sense for the historic Levi Strauss & Co.
What’s most important, both Nike and Levi’s understand that consumer experience and personalization are both key to driving retail traffic and making an authentic, lifelong consumer-brand connection. In today’s “always on” digital world, brands must ensure they are driving traffic from all of their digital connection points—eCommerce site, Apps, Facebook, Instagram, and Twitter—to their retail stores in order for those retail stores to survive. Too many often assume their consumer digital experience revolves around just their online store. Omni-channel services including online purchase/in-store pick-up, order online/return to store, and order online/ curbside pick-up. And now the competitive edge is superb consumer service delivered via online chat, digital assistants, smart chat-bots, etc. Thus, it is imperative that the consumer services team has omni-channel visibility to consumer transactions. Its not helpful to the consumer if a retail associate cannot accurately process a return of an item purchased online. Brands must also take consumer experience and personalization to a new level if they want their retail stores flourish. The leaders will find ways to make it easier—friction free—for consumers to discover product features/benefits. Consider scannable barcodes and hang tags on products that provide the consumer PDP like product details, consumer reviews, sizes currently available at the specific store the consumer is shopping. Or think of the dynamic ability to ask a sales associate to find a “size 4 in black” and add it to a dressing room—without having to chase someone down to do so. Brands must find new ways to leverage digital technology, such as tablets and digital signage to enable easy, convenient discovery. Ultimately, brands need to assess the benefits of providing “concierge like” services that empower sales associates with access to a consumer’s purchase history to support knowledge-based in-store up-sell and cross-sell. Sephora’s digital skin tone to foundation matching service offered in their retail stores. Rebecca Minkoff’s use of smart mirrors in fitting rooms, allowing shoppers to browse for other sizes or products that might complement whatever they’re trying on. Smart walls also suggest new styles when people pass by or enter, even allowing customers to order champagne to enjoy while they browse. 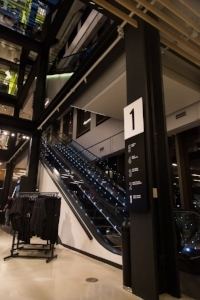 Lululemon’s use of RFID tags to digitally track and locate retail store inventory. If the product the consumer wants is not available on the selling floor, it is easy for the sales associate to check if it is in back-stock, check if it is in stock at a nearby store, or determine if that specific product/size is only available online. No matter what, the consumer is presented with options to ensure she can easily purchase the item she wants. Amazon’s “unmanned” store, which allows consumers the ease and convenience to get-in and checkout quickly and easily, without required human interaction or support. The bottom line: all technology aside, when deciding which types of consumer experiences and personalization to incorporate into physical retail the most important thing all brands must do is to ensure the experiences are authentic to the brand’s soul.